Rochester, NY is often called the Flour City in honor of the mills that once thrived along the faster courses of the Genessee River. That nickname, however, acquired the alternate interpretation of Flower City once the flour trade dwindled and folks got serious about the blossoms that star in spring around here. Lilacs are kind of a big deal in Rochester. 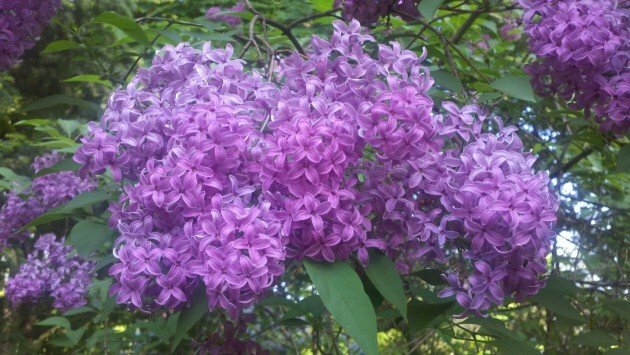 In fact, the spring festival season kicks off with the Lilac Festival, now in its 115th year. Curiously, the Lilac Festival can’t always promised peak blooms in the face of changing climate, but seems to ensure at least one rainy weekend a year! I didn’t make it to the Lilac Festival, but saw plenty of lilacs in bloom. I saw a few birds as well, the best of which was a spritely American Redstart. Corey had an absurd array of avians to choose from as his Best Bird of the Weekend considering that between Friday and Sunday he saw 148 species in his journeys around Queens, the Bronx, and Sullivan, Ulster, and Orange Counties. His best bird, however, was a bit of a surprise – a Winter Wren in Queens on Friday, a very late bird for New York City. He heard another on breeding territory in Sullivan County on Sunday and wondered if the bird he saw Friday had made its way north. If only we could recognize birds as individuals! let me to be first to commment ………for alll u people thats scaried im your worst night mare just kidding im never anyones nite mare i love birds but not when they bite then they are maen in some just have to get layed down….or put to sleep parmently!! An eye-level look at a singing male Indigo Bunting in a brief window of sunlight before drizzle started. My best bird was a Wilson’s Warbler, which was a new county bird for me. These days new county birds are getting harder to find. It was also the first Wilson’s Warbler I’ve heard singing. Cooper’s Hawk trying to get the Painted Buntings on my feeder. Bad Hawk! 3 Nighthawks over our new yard were fun to see. I remember being disappointed at missing the Lilac Festival last year when we spent all those weeks in Rochester. It was one of the few weekends we didn’t stay. Amid all the wonderful lifers I saw during the Spring Wings Festival in Fallon, Nevada (more to come on that! ), my favorite bird of the weekend wasn’t even part of the program … my lifer California Quail, which scurried across the street in front of our tour van. So unexpected, and so cute! …but I couldn’t identify it. It was very fast, and I only saw it from behind. I’m the worst birder ever.